There was a conference in Sievierodonetsk where social teachers discussed the problems of migrants. The scientific and practical conference “Social Problems of the Students-Migrants in Modern Society” was held at the premises of Sievierodonetsk Vocational Construction Lyceum. 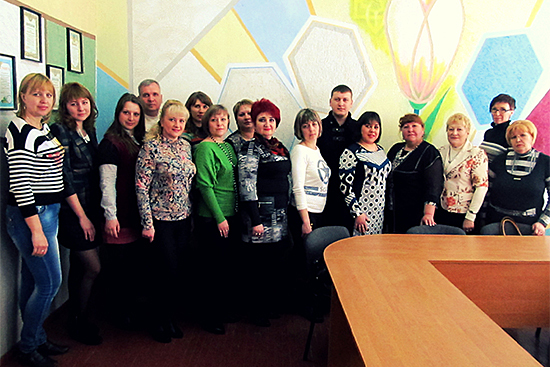 The forum was participated in by the scientists of Luhansk Taras Shevchenko National University and social teachers of vocational educational establishments of Luhansk region. Social problems of the students-migrants in modern society and ways of their solving were discussed by Doctor of Pedagogic Sciences, Director of the Institute of Pedagogy and Psychology of LNU Olena Karaman; Candidate of Historical Sciences, Docent, Head of the Marketing Department Ihor Lysenko; Head of Division of Student Social Service Olena Dorohavtseva. The participants summarized the problems and experience of practical work with children and parents of migrants. During the joint work the scientists and practicians found practical recommendations for social-pedagogic work with migrants and decided to keep cooperating in this subject.